An archaeological expedition from the prestigious Miscatonic University has vanished in the frozen wilds of Alaska. Now, a team of intrepid investigators from Arkham must brave strange storms and unthinkable horrors to find them, and confront the ancient darkness that they have awakened. 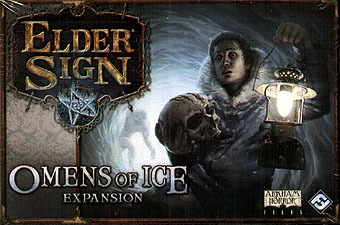 The Omens of Ice expansion provides a new adventure set in the cold and mysterious wilds of Alaska. As fierce snowstorms roll over the world, investigators must utilize every resource at their disposal to seek out the source of these storms in the far north and seal it away for another thousand years. They must face new horrifying Ancient Ones, monsters, and mythos cards that will challenge even the most seasoned investigators. Players are also provided new allies, spells, and items that can be used while adventuring in any locale.